Following a series of organizational meetings initially arranged by founder Carolyn Lomax, the Association of Canadian Women Composers (ACWC) was officially established on November 2, 1980. The purpose of the organization was to promote the music of Canadian women composers and provide for them a support system. From November 1980 to May 1982, the ACWC was governed by an interim Board of Directors, consisting of a President, Chairperson, Secretary, Treasurer and two other board members. In March 1981, the ACWC drafted a constitution which confirmed this governing structure, requiring that a new board of directors be elected by ACWC members at the first Annual General Meeting, which took place in May 1982. As many as 9 board members were to serve terms of two years. Subsequent constitutional and by-law changes eliminated the position of President and established other positions with varying responsibilities. The bulk of the records were accumulated from members of the Association of Canadian Women Composers between 1988 and 2011. The records were stored at the home of the ACWC Archivist until 2011, when they were donated to The Banff Centre Archives. A small set of records was maintained by former ACWC President Ann Southam at her home until her death in 2010. They were donated by her estate along with her private papers in 2012. In 2014, the project archivist identified these records as belonging to the records of the Association of Canadian Composers and included them in the arrangement and description of ACWC records. 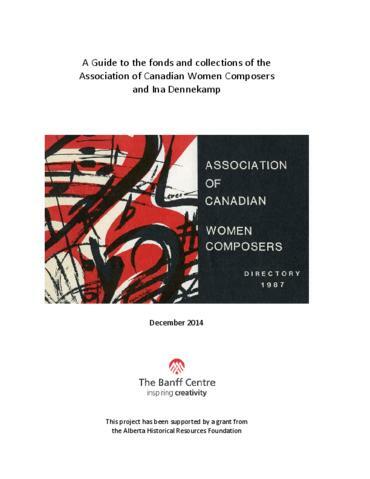 Fonds consists of records generated by the Association of Canadian Women Composers (ACWC), including the Association’s formation and its subsequent activities. The bulk of the records concern the administration of the Association itself and address issues related to governance, financial management, and member recruitment. Other records concern the Association’s public activities, including sponsorship of concerts featuring works by Canadian women composers and other public initiatives intended to increase awareness of and provide support for Canadian women composers. Records include correspondence, financial records, minutes, publications, press releases, media clippings, membership records and other material.